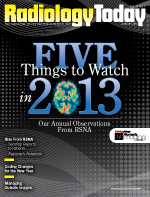 What stood out at RSNA 2012? There are nearly as many answers to that question as professionals who attended the annual conference, which was 26,273 (down 4% from 2011), according to the unaudited numbers from RSNA. Radiology is a field loaded with amazing, inexorably evolving technology. This year’s technical exhibits showcased less noisy MRI machines, a wireless ultrasound transducer, numerous tools to reduce and monitor radiation dose, and oodles of IT systems meant to increase interoperability, communication, and information access across a healthcare organization. Despite all this technology, three of the five selections for this installment of our annual “5 Things to Watch” focus on human aspects of providing imaging services. Interestingly, the basis for this snarky old joke—radiologists’ separation from patients—found its way to the core of RSNA 2012. “Patients First” was this year’s conference theme and the topic of the address by President George S. Bisset, III, MD. But based on discussions I had with some attendees, radiologists hold different views of what it means to put patients first. Many agree that delivering a prompt, clear report to the referring physician and being available for consults forms the core. Beyond that, things are not so clear. For instance, to what extent should radiologists directly provide reports to patients and be available for their questions? Opening that door forces radiologists to sort through what questions are best answered by a radiologist and which should be handled by the referring physician. Radiologists largely depend on referring doctors for their diagnostic work, so radiologists must be careful that expanding their interaction with patients isn’t perceived as usurping their referrers’ role. Imaging administrators have suggested to me that patient satisfaction would improve if on-site radiologists came out of the reading room to briefly talk with patients. Unless the radiologists are hospital employees, asking them to stop reading exams that form the basis of their pay so they can improve patients’ perception of the hospital is a little like writing a check on someone else’s account. Imaging departments would counter that patients’ satisfaction with the facility ultimately brings more exams into the hospital for radiologists to read and that radiologists need to better align their objectives with hospital objectives. Patient satisfaction remains something of a soft science, and radiologists often aren’t on the front line with patients. But it may prove very important in places with heavy competition for patients—and such places seem to be growing in number. Radiologists who run their own imaging centers appear to have a better understanding about competing for patients, so if you have a radiologist friend working in that environment (who isn’t a local competitor), you might want to talk with him or her about the topic. The changing relationship between radiologists and patients is definitely something to watch in 2013 and beyond. Increasing competition for patients also means greater competition among radiologists, including different forms of radiology practice. It seems radiologists are sorting out how they view that competition. Which of the following situations do you consider “predatory” radiology? Some of these situations were touched on during an informal lunch discussion about so-called predatory radiology. Competition in radiology is not just increasing; it’s taking on different forms. Radiology groups need to decide how they will react to that competition—or how they might act to head off competitors or competition. For good or ill, medical practice is becoming more like other businesses. Radiologists who embrace that idea have a better chance of continued success in that environment. And whether or note the above scenarios are considered predatory, physician groups need to rethink how they will compete against these (and possibly other) imaging service models. I went to Chicago for RSNA and HIMSS broke out. While the radiologist education programs at the meeting looked familiar, the exhibit hall seemed a lot more like the annual meeting of the Healthcare Information Management Systems Society. PACS and RIS simply have outgrown the radiology department and become a component of an organization’s larger IT system. One interesting change is the evolution of the vendor-neutral archive (VNA). Just a few years ago, most of imaging discussed VNAs in terms of the DICOM-compliant system that would simplify PACS migration from one highly proprietary PACS to a more open storage archive that would ease future PACS migrations. Vendors at this year’s meeting discussed VNAs as the software layer connecting the disparate digital information silos found in most hospitals so information can be delivered wherever it is needed in the organization. DICOM images, patient records, reports, non-DICOM images from dermatology and wound care, and digital fluorescein angiography images from ophthalmology are just some examples. This VNA layer serves to store information and connect it to the mushrooming numbers of data users—increasingly through EMRs. That’s what I loosely term “VNA 2.0.” The next generation of VNA will be sharing the same information between organizations. One vendor discussed VNAs as a sister of healthcare information exchanges. While PACS grew out of radiology and holds a prominent place at the data table because of imaging’s value and its sheer volume of data, imaging informatics is increasingly becoming a province of hospital IT as opposed to radiology departments. Some industry observers at RSNA noted that imaging’s volume of data might be eclipsed by the massive quantities of data generated by digital pathology. More and more imaging informatics vendors at the show noted that their customer is no longer the imaging director but the hospital chief information officer. The take-home point is that imaging IT has grown beyond the department level, and imaging personnel need to participate in the IT discussion and decision making at the enterprise level. The Supreme Court and voters have spoken since RSNA 2011, and the Affordable Care Act will move forward. My impression from RSNA was that, like the fifth stage of grief, the imaging industry seems to have accepted the coming of reform because it can’t really do otherwise. Denial, anger, bargaining, and depression changed the picture only slightly, and the imaging industry will ramp up its preparations for this change. Radiologists and imaging director types whom I spoke with expect the reimbursement squeeze to continue and volume to increase as more people come into the system under the law. Less clear is how accountable care organizations (ACOs) and other delivery models will affect radiology. Under the fee-for-service reimbursement model, radiology is a true revenue center for a hospital. As ACOs and other models change reimbursement, imaging probably will be seen as more of a cost center. Exactly what that will mean remains to be seen, but I saw a little more optimism than might be expected. Several radiologists and administrators pointed to the anticipated influx of patients from so-called Obamacare and the glut of aging baby boomers graying into their peak years as healthcare consumers will increase demand for imaging services and offset some of the anticipated reimbursement reduction. One doctor suggested that radiologists in an ACO environment might see a new opportunity in evaluating the value of exam orders in the health system. He believes that some radiologists will be well positioned for the job of helping ACOs decide which exams—and which types of exams—will best contribute to improved outcomes. He contends that radiologists with access to medical records would be much better suited than either appropriateness criteria or radiology benefits managers in determining which tests would be of most value to the patient and the healthcare system. While reimbursement reductions have changed radiology from the booming growth years of the early 2000s, many think that uncertainty over the future of healthcare reform had its own dampening effect on the industry (and the larger economy). A little more clarity might nudge things in a positive direction. After wondering whether it might be premature to put appropriateness criteria on this year’s list, I included it because it’s good sense to have the navigation equipment on board the ship before it leaves the dock rather than work it out later. Somehow, I think appropriateness criteria will have a significant future in the reforming world of radiology. ACOs and other models that move away from strict fee-for-service care will provide some push, as the widely held perception that some significant percentage of imaging is unnecessary will make it an inviting target. When ACOs receive a bundled payment for care, there will be incentive—and people tend to do what they are “incented” to do—to make sure an imaging exam is necessary and truly will add value to the care process. If I were a radiologist, I’d want radiologist-developed criteria guiding that decision rather than some mysterious radiology benefits manager. National Decision Support Company’s ACR Select, which is the commercialization and distribution channel for the ACR-developed criteria, is an example that was shown at RSNA. Its menus guide referring physicians to an appropriate exam based on evidence-based criteria developed by radiologists. Wide use of such criteria also could help establish some malpractice protection for doctors who order and provide exams that are supported by the best evidence. Another valuable piece of the puzzle could be a legal safe harbor provide by Congress for doctors using such evidence-based criteria. Showing solid, more standardized and accepted evidence for exams just makes sense in the healthcare future where providers will be increasingly required to prove that the services they provide bring real value to the care process. You know the value of diagnostic imaging, but showing it to will be an important part of the coming imaging market.